R.D. Olson Construction Launches $34 Million Courtyard by Marriott Project in Anaheim, Calif.
Anaheim, Calif. – R.D. Olson Construction is commencing construction on the six-story, 221-room Courtyard by Marriott hotel in Anaheim, Calif., within walking distance of the Disneyland theme park. The Irvine, Calif.-based general contractor was selected by owner Northwest Hotel Corporation to construct the $34 million hotel, which is slated for June 2015 completion. R.D. Olson has been an active builder of hospitality properties over the past three years, completing more than 1,000 hotel rooms in California and Hawaii during this time. The Courtyard by Marriott Anaheim features design elements that will appeal to the leisure sector that predominates hotel demand in the area. The hotel will showcase family-friendly features such as bunk beds and spacious bathrooms in each guest room, and offer Alpine-inspired views of Disneyland’s Matterhorn ride. Guest amenities include a 20,000- square-foot water and recreation park with slides, water cannons and tipping buckets, as well as a pool and spa, outside dining space, lounge, gift shop and meeting space. 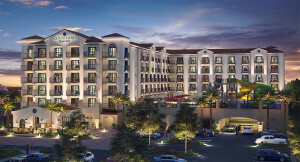 “We are able to take our experience incorporating Marriott’s newest Gen Next design in the Courtyard by Marriott Irvine Spectrum, as well as our experience across multiple Marriott brands, and build on those concepts to integrate additional family-friendly features into this hotel,” said Joseph G. Cervantes, senior executive vice president of operations for R.D. Olson Construction. The hotel’s interior and exterior design will weave in subtle Spanish architecture through the use of a Santa Barbara plaster-style stucco finish and clay tile Mansard roofs. The property will include Courtyard by Marriott’s latest high-tech, high-style Gen Next design features, including welcome pedestals that replace the traditional front desk, an interactive GoBoard™ to display news, weather, traffic, and destination information, and semi-enclosed Media Pods with individually controlled flat-panel TVs that offer a place to work, meet or relax. R. D. Olson most recently broke ground on the 170-room SpringHill Suites by Marriott in Downtown Burbank, Calif., and is in the process of a significant hotel conversion near Los Angeles International Airport. The firm is also nearing completion on the 210-room Courtyard by Marriott Irvine Spectrum. Earlier this year, R.D. Olson Construction was honored with the ENR Best Projects Award of Merit for the LEGOLAND® Hotel project.